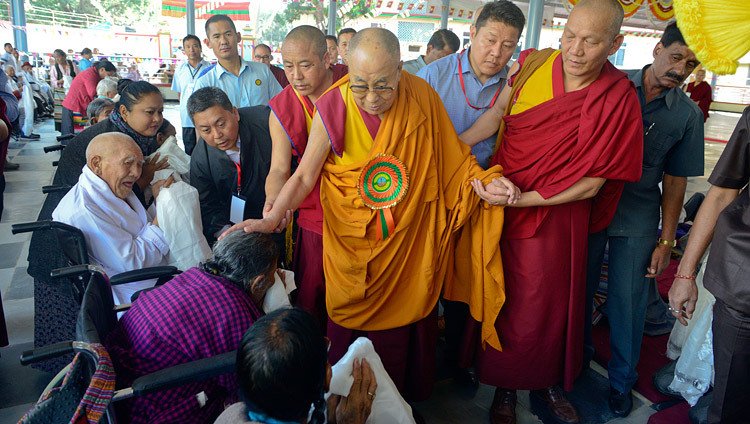 Mundgod, Karnataka, India – Before leaving Drepung Lachi Monastery this morning, His Holiness the Dalai Lama met with pilgrims recently arrived from Tibet. He sat at the top of the steps to the temple while they were gathered in front of him. “The spirit, courage and determination of Tibetans are amazing,” he told them. “I’m very happy to be able to meet you here. I’m not referring just to the last 60 years. Faced with all kinds of hardships since the time of Tri Ralpachen and the fragmentation of the country under Langdarma, Tibetans’ determined spirit has been unwavering throughout. Despite all kinds of political change and other pressures, it remains undiminished. This is something I really want to acknowledge. “Many of you pray I will live long and will soon be able to go home. Of course I want to see Tibet again. And considering how the people of Tibet have kept their spirits up, I want to meet them in person. However, the Chinese authorities haven’t looked on this favourably. They still brand me a ‘reactionary’ intent on undermining their control. If I were just to turn up they might arrest me. Then what would we do? We have to take reality into account. To imagine that just making hopeful prayers will make everything all right is not practical. Once again, as His Holiness drove across the Mundgod Tibetan Colony, people thronged the roads, with smiles on their faces and flowers and white scarves in their hands. Reaching Jangchub Choeling Nunnery he was received by the Abbot, Geshe Lobsang Tsultim. His Holiness cut the ribbon to formally open the gate to the new covered debate ground. Walking to his seat on the daïs at the top he stopped to greet residents of the nearby Old People’s Home, as well as saluting the nuns and their teachers. Addressing the assembly, His Holiness remarked that Jangchub Choeling is one of the oldest nunneries in exile and is distinguished too by its high standard of education. “I’m glad to be here among you. I greet you all, as well as the residents of the Old People’s Home who have joined us. Tibet is a land with long history and a rich civilization. We have our own language in which the more than three hundred volumes of the Kangyur and Tengyur are written. Despite the difficulties we have faced Buddhism has become deeply ingrained in our minds. The people of Tibet have preserved their language and culture for centuries and yet now, under the pretence that they somehow represent an urge for separation from China, the Chinese have deliberately tried to obliterate them. “Here in Karnataka we have re-established our centres of learning. Buddhism is not dependent on faith alone; it relies on reason and logic. The Buddha taught about the two truths, the path to follow and the resultant state of Buddhahood. The two truths highlight the difference between appearance and reality—ideas familiar to scientists. He revealed the path, the way to practise it and explained how we can achieve our own realization. 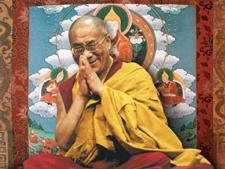 “In the past many Tibetans had faith but didn’t know what Buddhism was really about. Consequently, after we’d come into exile I encouraged monasteries like Namgyal Dratsang, Gyumey and Gyutö, which had no tradition of rigorous study of the classic works of philosophy, reason and logic, to introduce opportunities for their members to become familiar with them. “The Buddha allowed both men and women to take full ordination, and yet for a variety of reasons the Bhikshuni Sangha was not established in Tibet. Changing that is not something I can decide by myself. It requires a consensus of the Sangha. However, I have been able to encourage more people to study. One consequence is that last year twenty nuns, including several from here, were awarded Geshe-ma degrees. You’ve all worked hard and I’d like to thank you. His Holiness recalled that there are Chinese and Korean nuns at this nunnery. They come from traditions that also recite the Heart Sutra even if they do not always know what it means. He reminded his listeners that it is important that the words, ‘form is emptiness, emptiness is form’ remind them of the lack of intrinsic existence. The nuns then gave an assured demonstration of debate covering the five topics of monastic discipline; higher knowledge of philosophy, psychology and ethics; the middle way view; the perfection of wisdom; and logic and epistemology. From Jangchub Choeling His Holiness drove on to Ganden Lachi Monastery. He was welcomed at the foot of the steps by the Ganden Throne Holder and escorted into the temple. As he had done in Drepung Lachi, where he paid obeisance before the stupa commemorating Kyabje Ling Rinpoche, his Senior Tutor, here in Ganden he paid his respects before the statue of Kyabje Trijang Rinpoche, his Junior Tutor. Once he had sat down the Ganden Throne Holder presented a mandala and representations of the body, speech and mind of enlightenment. The Chant Master led a recitation of Je Tsongkhapa’s ‘Three Principal Aspects of the Path’. “Here at Ganden Nampar Gyalwai Ling Monastery, the Abbots of Shartse and Jangtse Colleges have ensured that great efforts are made to study Buddhist philosophy, contributing to the flourishing of the Dharma,” His Holiness declared. With that His Holiness retired for the day.